This spring, we enjoyed planting our organic vegetable garden, fruit trees and flowers which took its toll on my skin. Therefore, I was very excited to try the latest collection from Crabtree & Evelyn English Honey and Peach Blossom. This luxurious line of bath and body products was designed for intensive skin conditioning and it performs beautifully to repair my dry, rough skin. Featuring Hand Therapy, Body Butter, Body Wash, Body Lotion, Glistening Face Serum, Moisturising Cream, All Purpose Balm and Lip Salve this is the must-have body care line for spring and summer in my opinion. All of the products in this collection are made with the natural extract of wild flower honey which is well-known for the ability to soothe dry and parched skin. The light, subtle aroma of rich honey and glorious peach blossom is very appealing to me as I do not like overpowering scents especially in the warmer months of spring and summer. The English Honey and Peach Blossom Body Wash (SRP $20) is a thick and luxurious (just like real honey) and it makes a wonderful lather as it cleanses my skin without stripping it of much needed moisture. I love that when I use this product in the shower or even as a foam bubble bath my normally dry skin doesn’t have that tight feeling after washing. 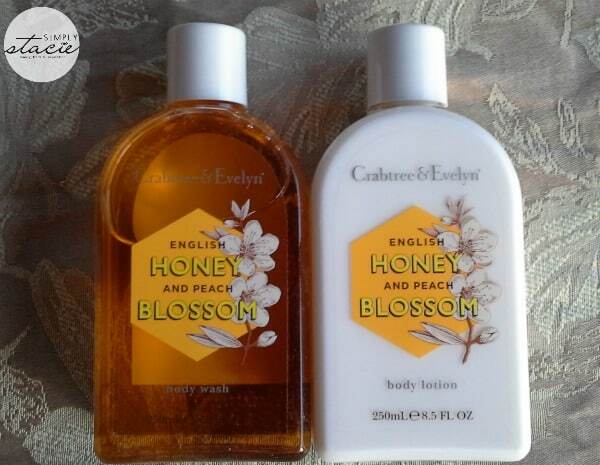 After cleansing with the body wash, I use the Crabtree & Evelyn English Honey and Peach Blossom Body Lotion (SRP $22) which is formulated with honey, peach blossom extract and Shea butter for an effective and surprisingly lightweight skin conditioner. I love to use this product all over my body especially my legs and arms and I appreciate that it is not heavy or greasy at all so I can use it through the spring and summer months in Florida when the days are very hot and humid. 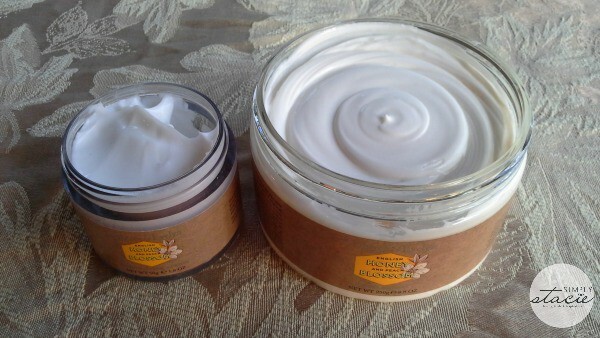 For those extremely dry areas such as the skin on my elbows, knees and feet, I really like the Crabtree & Evelyn English Honey and Peach Blossom Body Butter (SRP $36) which gives more intensive moisturizing with honey, Shea butter, Peach Blossom Extract and the addition of Moringa oil for extra skin softening. I have even used this product to help restore my young daughter’s skin because she has eczema and it gives her much needed relief for her dry, irritated skin. For spot treatments of extremely dry skin, I highly recommend using the All Purpose Balm which works great too. My favorite body care product in this collection is the English Honey and Peach Blossom Ultra-Moisturising Hand Therapy (SRP $8-$20) which really soothed my chapped, roughened hands after days spent in the gardening. I don’t normally like to use a hand lotion because I don’t like the feeling that I get with other products but this hand therapy is perfect as it is extra rich and luxurious without any greasiness. A tiny amount of product which also features Macadamia nut oil absorbs effortlessly into my hands and my skin feels wonderful with no dry, irritated patches……even my husband complimented me on how soft my hands felt. For the face, I love the Glistening Face Serum (SRP $32) which soothed away dryness and irritation for my sensitive skin and left before a more radiant glow after using for two weeks. I don’t wear a lot of makeup on a daily basis so I love to use beauty products that help my skin to look its best and this really provides long lasting moisture. It is especially wonderful after a day out in the sun to help soothe my naturally dry skin….I just love this product from Crabtree & Evelyn! At night, I apply the Moisturising Cream (SRP $32) to my face and neck. It is a great product to try if you have dry skin like me or very dry skin because it is made for intense hydration without making my skin feel oily. In the morning my skin always feels very soft and supple and those little dry patches around my eyes and cheeks are gone! I often neglect my lips because I don’t like the feeling of most lip balms however the Honey Lip Balm (SRP $4) from Crabtree & Evelyn is the exceptional as it feels and smells wonderful to combat my dry, chapped lips. We recently enjoyed a boat ride and normally my lips will have cracked open in the windy, dry heat however when using this product during the day I didn’t experience any dryness at all! I really enjoy using the Crabtree & Evelyn English Honey and Peach Blossom collection for my dry skin….in fact, I consider it a must-have essential line in my daily beauty regime this spring. As a woman who always prefers a more natural approach to health and beauty, I appreciate that Crabtree & Evelyn products do not contain parabens or phthalates and formulated without mineral oils. You are invited to visit the Crabtree & Evelyn website to purchase these products, explore the entire collection and find a store nearest to you. I would like to try the Pear and Pink Magnolia Body Lotion. I would love the lasource relaxing bodywash for me! My favorite product is the Hand Therapy Paint Tin Box. My favorite product is Sandalwood Eau de Toilette! I would love anything in their Tarocco Orange, Eucalyptus & Sage fragrance. I’ think i’d like the Old World Jasmine Flower Water. I’d love to try the Old World Jasmine Flower Water. The Classic Rosewater lotion is my favorite item. I would like to try the Pear and Pink Magnolia Body Soufflé. The West Indian Lime Body Wash is my favorite product. I have always love the classic rosewater scents!! I would totally buy the Pear and Pink Magnolia Body Soufflé. My favorite is the Caribbean Island Wild Flowers Body Polish. The Lavender Body Cream is my favorite. all of these products sound wonderful. Please let me win! I like the Pomegranate, Argan & Grapeseed Conditioning Shampoo. 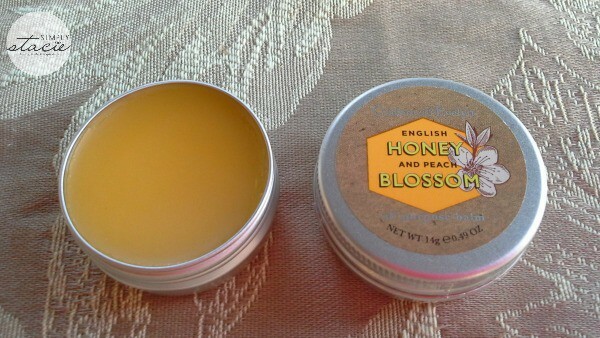 I like the English Honey and Peach Blossom Moisturizing Cream. I like any of the body creams. I would love to have all of the Night Garden collection and sandalwood. I like the Rosewater bath and shower gel. I love their Evelyn Rose eau de parfum. I like the body creams. Can’t come up with a favorite. I like to change them with my mood.